Vancouver Rowing Club will be hosting the third event in the Friday Night Challenge Series. Participants will have the chance to mix and mingle by rowing with members from other clubs in mixed 8+ and 4x boats which will be assigned day of. Participants are not required to bring their own boats. Don’t miss this opportunity to row through scenic Coal Harbour and Stanley Park, some of Vancouver’s most iconic landmarks! Participants should arrive at 6:00pm and be ready to race by 6:30pm. There will be a warm up in the harbour from 6:30pm-7:00pm before racing at 7:30pm. The BBQ will start immediately after racing, approximately 8:00pm. Registration is available over the phone by calling 604-687-3400. All participants must be members of Rowing BC and Rowing Canada Aviron. Even if the Vancouver Rowing Club is not in your neighbourhood, we encourage you to attend! From Victoria, take the 3:00pm ferry from Swartz Bay to Tsawwassen. Vancouver Rowing Club is located approximately a 45-min drive from Tsawwassen. From Nanaimo, take the 1:15pm ferry from Departure Bay to Horseshoe Bay. Vancouver Rowing Club is located approximately a 25-min drive from Horseshoe Bay. 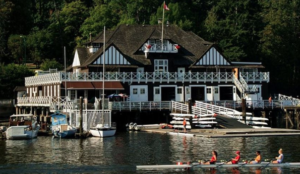 The address for the Vancouver Rowing Club is 450 Stanley Park Drive. Pay parking is available throughout Stanley Park. While you’re at the Vancouver Rowing Club, check out beautiful Stanley Park by foot or on the 10km long bike path that wraps around the park. You’re only steps away from Vancouver’s vast downtown including endless shops, restaurants and attractions like Canada Place, the home of Fly Over Canada, and Harbour Green Park. Check out the sunset at Second or Third beach on the West side of Stanley Park.